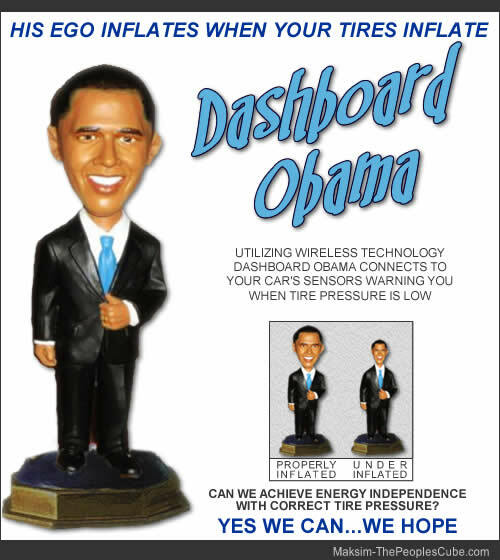 Dashboard Obama, His ego inflates when your tires inflate. So Obama is putting specifics to the Congressional Democrats energy policy of "conservation and wait for the wind". Maybe he should add "accelerate like you have an egg under your gas pedal." I'm sorry, this is not an original policy. The Shell Answer Man used to say the same stuff during the first gas crisis in the mid-70s. This new device will be the inspiration of many Obamagasms during rush hour gridlock. I find it impossible to imagine The Chosen One suffering from under-inflation! I believe the Messiah will wave his hand and the world will suddenly become a perfect place. That their will be no need to check your tires because the Obamamessiah will make every thing float on air, you will not need a vehicle anyway, under the Messiah your government will come and pick you up in a new ZIL limo, drive you where ever you would like. All those rich capitalist pigs will be transported to the gulags, borsht in every pot. It will be a true workers paradise. Should I have my tire inflation verified by a party official, or can I actually do it on my own? The only guage I have reads in "PSI", which is not as multicultural, uniting, and eurocentric as kg/cm, so I think I will hold off until proper guages are issued. After all, no American has ever truly properly inflated her/his tyres until BHO (blessings be upon him) proposed it. Now if we can only get the government to help us increase inflation. Filling the gas tanks of Amerika with the sweet emissions from the messiahs mouth is the next obvious step. The mime almost made the cut. I hereby denounce MENSA as a sexist organization and demand that its acronym be changed to PERSONSA. I hereby denounce MENSA and PERSONSA as being species-centric and demand the acronym be changed to CREATURA. And exclude fictitious characters? You people are so totally essocentric. Forget the sexism and specism and fictionism and all that. We should all be denouncing this organization for excluding anyone (e.g., me me ME) who doesn't meet their criteria, which is totally unfair, not to mention a blow to my self-esteem. Imagine being told, "Sorry, Pinkie, you can't join us. You're not SMART enough. You don't score high enough on this one particular test that was put together by none other than a bunch of white males of predominantly European descent." Tell me the deck isn't already stacked against me! I would denounce Navigator just for bringing it up. Pinkie, why would you care about joining MEN/PERSON/CREATURE-SA? The only thing anyone really needs to join is the party. Why, I thought that saying was attributed to Mikael the Mime, a self-proclaimed borderline genius who also coined the expression, "digitally lobotomized." In fact, that quote might explain all the empty chairs at his weekly impeachment meetings and no-shows at the storming of the state capitol. I heard tonight on the news that our comrades at the UN are being told to start dressing lighter, for they are going to raise the thermostat 5 degrees which according to their engineers, will save the UN $100,000, which will equal one day of graft in various programs, and help save the environment by reducing the amount on steam being introduced into the atmosphere. This is wonderful, and I have no doubt that OPEC is getting worried they will soon be put out of business. But that will not come until the People's Science Bureau discovers the Magic Energy Bean™ which will provide all the energy we need yet not be a threat to Mother Gaia. Unless thats a bad thing? Didja hear ElRushbo talking about the Dashboard Ωßama thing today? I don't think he had all the facts right...or more likely it was me....but it sounded just like Dashboard Obama chatter. I have not heard that chatter yet, but have you seen the hideous museum this enemy Rush has put up? Of course being Marshal, I have to keep up with all movements of the enemy, so I am in possession of the " Rush 24-7" code. This museum of his is filled with neo con WMD. Strawberry? Don't you mean "Red"?? All good comrades should follow adwice of fearless leader and inflate tires daily. BorisDid you know there millions of under inflated tires in Amerika today and tomorrow, it will only get worse? Fellow comrades, follow the advise of Boris here! Check your tires, or we'll be stuck on foreign oil forever! I think if inflating your tires is going to save oil then wouldn't it stand to reason that drinking less beer will make toilets last longer? Comrade Obama has answered our energy prayers! Demand Background Checks On Peoples Buying Pressure Cookers!